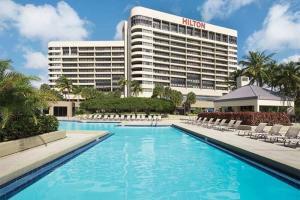 At the Hilton Miami Airport hotel, guests can enjoy the 100-acre natural lake, a jogging trail, outdoor pool, tennis and basketball courts. Accommodations include 508 rooms which offer views of the lush foliage, freshwater lagoon, and Miami skyline. This convenient location is just a short 10-minute shuttle bus ride from the Miami International Airport and close to shopping and dining. Located in Miami, Florida, just a few miles from the airport.